In December 2003 I wrote the following article for ReALMagazine.com, which no longer exists. Since Five Iron Frenzy has since risen from retirement, it seems appropriate to re-post it. Plus, you know, I want to link to it. A long time ago in a square state far, far away there was a band named Five Iron Frenzy. Sadly, that band is no more. This is their final story. On a cold December evening in 1996 I visited my local Christian bookstore and began a new musical journey. A funky new album called to me from the shelf, the debut album from Five Iron Frenzy, Upbeats and Beatdowns. I’d never heard of them before, but after hearing the first strains of “The Old West,” I was hooked. Later that night I listened to the entire album until 2 a.m. This is the incredibly self-indulgent, and overly-lengthy final article about a band that has had a deep influence on my thinking and my mad dance skills. Before Five Iron, my favorite band was Petra, the over-the-hill rock band of the Christian ghetto. After Five Iron, my favorite band has been U2, the faith-friendly, biggest rock band of the world. I’ve seen Five Iron Frenzy in concert almost a dozen times, I own every major album release, and I’ve interviewed different band members at least five times. What you’re about to read is completely biased reporting. We’re talking more tribute than typical feature, and I hope you’ll cut me the slack. And if not, too bad, because here we go. In the mid-1990s a rush of popularity brought third-wave ska bands to the masses. The Christian music scene was not immune, with Southern California’s Supertones, Denver’s Five Iron Frenzy, and Detroit’s Insyderz all rising to a national level. Without a doubt, the Supertones experienced the most success, playing for the pope and probably being the most CCM-friendly of the new wave ska bands. The Insyderz went the route of many alternative Christian bands, playing small shows to a respectable national crowd. Their moment of glory was the worship album Skallelujah, released on Steve Taylor’s Squint Records, which became an early part of the worship movement that’s so prevalent today. But Five Iron Frenzy went a slightly different route. Their goofy yet deadly serious nature was too much for the safe confines of the CCM industry, yet they were too big and too good to be content with the underground Christian alternative scene. They drew a diverse crowd and even flirted with mainstream success, including playing dates on the Warped and the Ska Against Racism tours. But all good things must come to an end. The popularity of ska faded as quickly as it came, leaving the ska bands floundering. The Supertones experimented with new sounds, eventually settling on the rap-rock hybrid made popular by Limp Bizkit and Linkin Park. The Insyderz hung on for a while, releasing two albums on the struggling KMG records, before finally disappearing. Lately they’ve reconvened and churned out a new album, Soundtrack for a Revolution, which so far hasn’t made much of a wave. 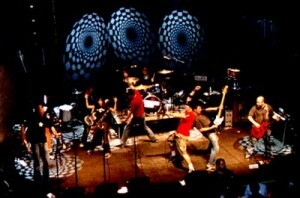 For Five Iron Frenzy, the changing musical landscape meant a chance to stretch their creative wings. All the Hype that Money Can Buy is full of experiments, while Electric Boogaloo and The End is Near settle on a rock-driven, horn-backed assault. But in 2002 they announced the end. Since the beginning the eight members of Five Iron Frenzy — Reese Roper on vocals, Micah Ortega on guitar, Keith Hoerig on bass, Sonnie Johnston on guitar (Sonnie replaced original guitarist Scott Kerr in 1999), Andy Verdecchio on drums, Leonor “Jeff the Girl” Ortega on saxophone, Dennis Culp on trombone, and Nathanael “Brad” Dunham on trumpet — have met with their pastor ever year to make a decision about the coming year. That decision sparked a final intensive year of Five Iron productivity, including a b-sides, rarities, and goofy tracks collection, officially titled Cheeses (but unofficially known as Cheeses of Nazareth), a final studio album, The End is Near, and a farewell tour, the Winners Never Quit tour with Cameron Jaymes, Holland, and Bleach. The final tour brought a lot of fans out of the woodwork. Many parents and little kids came to the shows, in addition to the unruly crowd of teens and early twenty-somethings who make up Five Iron’s core audience. Even new fans came to see the band before they miss their final opportunity. “Not that all of our fans are that mature,” he adds. Over the band’s eight years of intensive touring, five studio albums, an EP, a live album, and countless 7 inches and compilations, there have been many lessons, but no regrets. One of the biggest impacts the band has had comes from their efforts to do something more for the local community than rock and roll. Nearly every Five Iron Frenzy tour has included some giving project where fans were encouraged to bring canned goods, socks, blankets, pants, or whatever the theme happened to be. But touring isn’t the rock and roll lifestyle you might imagine it to be. Hoerig and Ortega say it’s like a combination of being a truck driver, working in a warehouse, and being homeless. “But being really, really popular,” Ortega adds. The transient lifestyle has shifted from the early days in a stinky van, to days in an overhauled school bus, to the current tour with cushy buses. But even on buses that have hauled the likes of the Dixie Chicks and a former Backstreet Boy, it’s still hard to get a good night’s sleep or even eat a decent meal. Early tours included plenty of stops for a gas station meal, where breakfast comes down to a choice between a banana and Ritz Bits Smores. Their song “Superpowers” was not an exaggeration. While Five Iron has flirted with their share of success, they’ve also kept their focus on more than the music. Recording label scouts have been to Five Iron shows and they’ve played major label showcases. An A&R guy from a major label even dropped by the studio while they recorded Electric Boogaloo. “Whatever it was they were looking for, we didn’t have it,” says Ortega. “So they signed P.O.D. instead,” says Hoerig. “Dreadlocks! That’s what we’re missing.” A discussion about whether or not Micah could grow dreadlocks ensues. With Five Iron’s longtime label, 5 Minute Walk Records, the emphasis was always on ministry. That gave the band incredible artistic freedom to explore the music they wanted and the themes they wanted. The result has been a mix of Five Iron’s signature goofy style and intensely somber themes, a mixture few record labels would go for, though obviously Five Iron’s fan have latched on to the strange brew. Those off the wall songs have included everything from an ode to Canada to a song about mullets, the ill-fated hairstyle of the Eighties. They’ve covered Tom Jones and sung about the rumored death of trumpet player Brad Dunham, as well as the constantly absent Micah Ortega. “Here’s the problem with that theory, Micah,” says Hoerig. “It would have worked out fine had we not been practicing at your house.” A fun-loving argument continues, until it’s finally settled that the show-skipping Micah recanted well before the song was written. “That’s the old Micah,” Hoerig says. But along with Five Iron’s silly core comes seriousness. The combination seems to accurately reflect the band, which is no easy feat. Part of that honest soul-searching has been manifested in Scum of the Earth, a church many Five Iron members are involved in. Ortega and Hoerig describe it as an overgrown Bible study with a funny name, but it comes down to being real. There’s a sense of righteous anger, both in the conversation and in the lyrics of Five Iron’s music, about the failure of the church today. But any anger about the state of Christianity today is reflected back on the band as well. Following Christ is no easy task, and the band members admit they struggle as well. “We haven’t seen it, but it’s amazing.” Hoerig says. While the band winds down and the last of the Five Iron products are released, the members will move on to better things. Roper and Johnston are joining with members of the Supertones and Ace Troubleshooter to form a new band, Guerilla Rodeo. Roper is also continuing his poetry, with a spoken word tour planned in early 2004. Micah Ortega will return to school to fill in the gaps in his recording knowledge with plans to record music full time. Andy Verdecchio is joining the band Yellow Second with former Five Iron guitarist Scott Kerr and others. Keith Hoerig is returning to school to finish his electrical engineering degree. Rumors persist of a coming engagement for Hoerig, as well as plans to do music with his soon-to-be fiance. Leonor Ortega plans to work full time with Scum of the Earth, as well as do music full time with her boyfriend. She’ll also be touring with Roper on the Spoken Word 2004 Tour, and has recently self-published a collection of her poetry. Dennis Culp will be working with the music house he helped start, Singing Serpent, writing music for ads. Brad Dunham will be settling down and starting a family. In many ways, the members of Five Iron will be returning to their dorky, pre-indie-band-fame existence (something they resonate with and have sung about in songs like “You Can’t Handle This” and “Suckerpunch”), but in their own ways they’ll continue on. As Roper sings in “See the Flames Begin to Crawl,” “I’ve got notebooks full of misshapen words, I’ll never speak them anymore. / Ten years from now you won’t know my name.” Perhaps we’ll have forgotten Reese Roper and all the rest, as well as Five Iron Frenzy, but we’ll carry their impact on in our hearts, fellow strugglers struggling on, hopers seeking hope, heads crowned with a mighty phantom mullet.